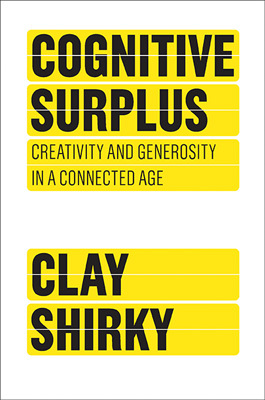 A few weeks ago, a random email asked if I wanted to take part in helping promote Clay Shirky’s new book Cognitive Surplus on a blog book tour. As a follower of Clay’s writing for many years, I enthusiastically said yes, and they sent a hard copy of the book (I ended up buying a kindle version and read it on my iPhone, since I prefer that to printed books these days). Simply put, Cognitive Surplus is a fantastic read that is loaded with real-world examples as well as tons of research that ties all the concepts together. The gist of the story Clay weaves is how we’ve spent the previous 50 years staring at televisions but the internet enables us to finally talk back, and even tiny slices of the time wasted watching TV when applied towards some collective output can result in massive repositories of information like Wikipedia. He shows many contemporary examples of online collaboration beyond Wikipedia.org and breaks down the motivations for contributors that cites plenty of sociology, psychology, and economics research to back his points up. I’ve seen Clay speak at many conferences in the past and I’ve enjoyed, quoted, and argued many of his previous essays on his (sadly now languishing) site. I read his last book Here Comes Everybody as well, and the one thing that really blows me away about Cognitive Surplus is how he completely and utterly envelopes the points he wants to make. I feel like his previous work would touch on a whole bunch of issues but never really get to the heart of why things are the way they are, but in this new book he drills deep on every point with plenty of examples and studies to back him up. I’ve seen some criticism of various aspects of the book, where readers either think the trend of free collaboration online is short lived or that it’s not part of a larger trend as Clay sees it. Clay is very much a futurist in some aspects, and his expertise has always been in spotting interesting new trends very early on, and describing them to large audiences right before they take root and become the norm. I feel like we’re on the cusp of a real revolution now thanks to the democratization of online tools. Back in the early days of the web and even blogging, you had to be a programmer, developer, or at least technically minded enough to write your own software, publish your own HTML, and manage your sites using many disparate tools. It was very much like the days of very early television where the guys that could control the cameras wrote all the shows because there wasn’t any other way. In 2010, we thankfully have a ton of simple to use tools like Twitter, Tumblr, and Posterous that take the need to be a programmer or developer out of the equation and simply let anyone say what they want with minimal knowledge and minimal friction. In the future, we’ll see these tools used in ways we never thought possible and when the next unknown random person makes a post that becomes worldwide news, I’m sure Clay Shirky will be there to tell us all about it, and I very much look forward to reading about it. I got here trough Lifehacker and that’s the only reason why I bothered reading your article – if they recommend it, it must be good. I was OK, but frankly to read it I had to copy it over to Notepad. Your font is atrocious and painful to read. The top bits seem to blend away slightly and for a moment I thought that I lost sight. Feel free to delete this post of course, but for goodness sake do something about that font. I have heard there are issues with Windows and the custom fonts here. I may just change them back to something normal. You’ve made me quite excited to read Shirky’s book. I think what I like about Shirky is that when he explains his position on something, in this case talking about how the Internet is facilitating the a kind of participation that we haven’t seen for decades, my gut tells me that Shirky gets it. He gets the Internet and social media, and sees what direction they’re headed. Your excitement for this book is fueling my own excitement. Thanks for being on this tour! Really love your take on this. It’s an interesting topic and to imagine what sort of tools we will potentially see in the future that result from people freely collaborating online is exciting. Wikipedia is often cited as a prime example and rightly so but also consider The Internet Movie Database which pioneered much of this online collaboration and celebrates its twentieth birthday this year. One caveat from the IMDB story though is that the website that was built upon the efforts of thousands of people freely giving their time eventually became a commercial enterprise that was bought by Amazon and there is a premium version of the site that requires a subscription. It raises the question of who ultimately owns the information and has control over its dissemination. Just a small error in the article I noticed which you might like to correct – the link to the book on Amazon has a superfluous ‘http//’. I use Opera 10.5 with Win7 x64 and it’s a regular serif to me (though viewing at 140% so I can lean back without squinting). I’m glad to see that you enjoyed this book so much. This is my first exposure to Shirky’s ideas, and I definitely find them fascinating! Thanks for being a part of the tour. Firstly thanks Matt for the change in the font, it’s so much easier to read it now, that I barely recognised your blog! 🙂 I don’t know what was it exactly that made it so difficult to read before, maybe it was Windows, maybe Firefox, maybe just me being picky. Iris, I guess it didn’t affect everyone. Chair, sure it would be a workaround – I often read stuff in Google Reader and it makes it easier, but it’s a workaround not a solution. Again, sorry for being a pain 😉 I’m actually rather likeable person, I swear! Matt, the first link, the one for the book, is missing a colon, so it doesn’t work.